1. Follow all requirements of laws, rules and regulations applicable in your country pertaining to lifting operations, ensuring all maintenance, testing, inspection and operator training requirements are strictly adhered to. This is in your interest and can prevent fatal accidents and industrial disaster. Is any part of the equipment distorted? Are any cracks visible, or is extensive corrosion evident? pivots, pins, bolts, threads, springs or other moving parts? Are locking arrangements functional and safe? Are the Working Load Limit, serial numbers and other markings legible? Have all inspections or tests been regularly recorded? 1. Ensure that the selected SuperClamp™ equipment is of a suitable type for the lifting or suspension operation you intend to undertake. 2. 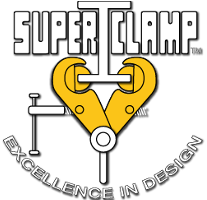 Ensure that structures to which SuperClamp™ equipment may by fitted are of adequate design and comply with all legal requirements. Structures designed for lifting operation purposes are usually marked with the Working Load Limit which may not be exceeded. Ensure that structures are tested and certified for such use and that the appropriate certificate is current. 3. Never stand beneath a suspended load. 4. SuperClamp™ products are primarily designed for in-line use only, and the equipment is thus marked. Never use SuperClamp™ products for side loading applications unless this is specifically recommended on the originalSuperClamp™ identification plate affixed to the unit. If the identification plate states that the unit must be used at 0 degrees only, then NO side loading/angle loading is permitted. 5. Never use a single clamp as a lifting point on a beam/girder. Always use two or more clamps to ensure a stable lift: use a spreader beam when applicable. 6. SuperClamp™ products must not be attached to defective structures or materials. Ensure that runway beams are fitted with endstops and are free from defects. Should a defect on a runway beam or structural member be observed, remove the SuperClamp™ unit immediately and report your observations to your supervisor. 7. When selecting SuperClamp™ products, ensure that the calculated Working Load Limit requirement allows for any additional weight of equipment which may be suspended together with the original load to enable the lifting operation to take place. 8. Ensure that all mechanisms on SuperClamp™ products are working freely before being used for the application intended. 9. Never replace worn components except with original SuperClamp™ parts. Where products are fitted with replaceable jaws incorporating teeth showing wear, it is strictly prohibited to recut or resharpen these. Cams or jaws incorporating teeth can be easily replaced with original SuperClamp™ components from your approved SuperClamp™ distributor. 10. Always ensure that repaired products are inspected and tested in accordance with the laws of your country prior to being released for operation. 11. Ensure that all persons using SuperClamp™ equipment are properly trained in performing lifting operations and are competently using this type of equipment. 12. If multipoint lifting operations are undertaken, always ensure that no singleSuperClamp™ unit or single point of lift is at any time required to exceed its maximum working load limit. Do not exceed angle ratings at any time as this may prove excessively dangerous. 13. Always ensure that parts are reassembled correctly after disassembly or repair. 14. Never throw or drop any SuperClamp™ equipment as this may be hazardous or may cause injury to people or plant. 15. If in doubt about the suitability of SuperClamp™ products for your application, contact your nearest distributor or the factory. 16. Your nearest SuperClamp™ distributor will advise on applications if required. The above working load limits and deviations have been established specifically for most "S" type clamps and only apply in overhead beam attachment, i.e. do not apply if clamps are to be used for lifting beams. (The Universal SuperClamp™ "USC" has been specifically designed for this purpose.) The tables apply to our clamps only (selected models) and we strongly advise that stress calculations should be carried out (by the user's engineering department) for any/all support steel work. WARNING: All Clamps must be correctly applied to the beam by a competent person and fully hand-tightened. If in doubt, contact the manufacturer for their recommendations!